"Private Miles O'Reilly" a book illustration by Edward Mullen, 1864. Edward "Ned" Mullen (sometimes Mallen or Mullin) was a well-known cartoonist and caricaturist at the time of the Civil War. He contributed numerous humorous sketches to the first Vanity Fair Magazine in New York City. He was mentioned as one of the "Bohemian Brigade" of writers and artists, including Walt Whitman, that gathered at Pfaff's Saloon in Manhattan for drinking and tom-foolery. Mullen illustrated several books, including the political satire The Life and Adventures, Songs, Services, and Speeches of Private Miles O'Reilly (1864), written by Charles Halpine. 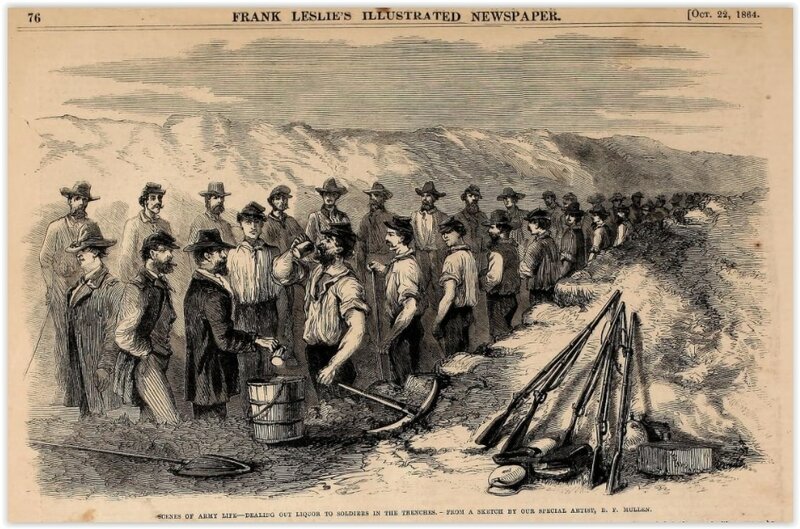 Mullen was pressed into service as a special artist for Frank Leslie's Illustrated Newspaper in June 1864 and arrived in Petersburg by the middle of the month. He collaborated with another Leslie contributor Andrew McCallum who was an aide-de-camp on General Orlando Willcox's staff in the Ninth Army Corps. He traveled to Washington DC for a time in July to document Jubal Early's threat to the capital. 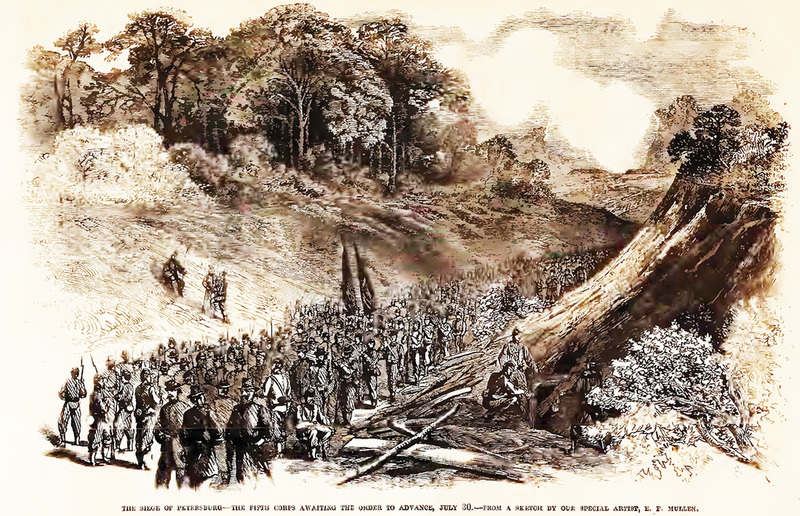 Union Earthworks at Bermuda Hundred -- one of the first illustrations attributed to special artist Edward Mullen -- in the July 2, 1864 issues of Leslie's Illustrated Newspaper. Details include a cleared field of fire, fraise, abatis piled in front of the embrasured battery, and rifle loopholes on the parapet made with sandbags. 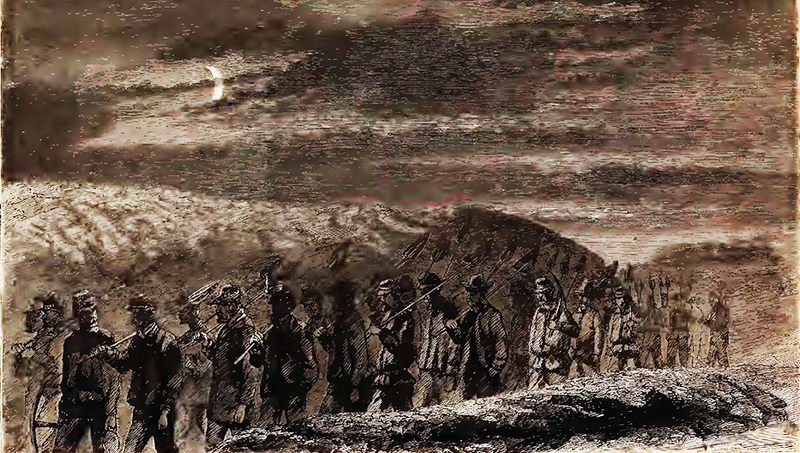 Thumbnail of "Regiment of the 18th Corps Carrying a Portion of Beauregard's Line." Follow the link to find the full drawing. Courtesy of the Becker Collection. 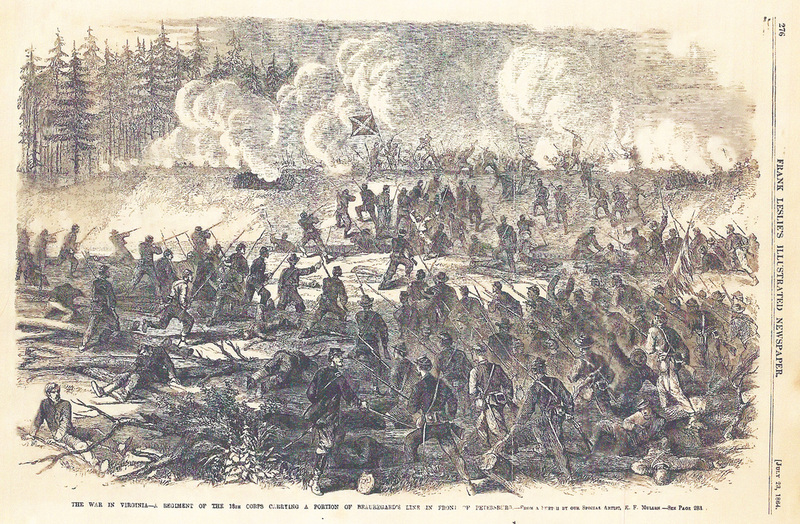 This drawing portrayed the fighting on June 15, 1864. Detail from "Regiment of the 18th Corps Carrying a Portion of Beauregard's Line in Front of Petersburg." Follow the link to find the full sketch at the Becker Collection. Woodcut of Mullen's drawing, published in Frank Leslie's Illustrated Newspaper, July 23, 1864, page 276. Fifth Army Corps soldiers in the Petersburg & Norfolk Railroad cut south of the Crater waiting to be sent into battle on July 30. Woodcut from a Mullen sketch published August 27, 1864 in Leslie's Illustrated Newspaper. The mine explosion is suggested by smoke in the distance. "Burying the Dead Before Cemetery Hill Under a Flag of Truce, After the Repulse of the Ninth Army Corps, from a sketch by E. F. Mullen." Frank Leslie's Illustrated Newspaper, Sept. 3, 1864. Gathered southern onlookers in the background frame this macabre scene. The U. S. Colored Troops killed during the battle of "The Crater" were buried during the brief truce that followed. This is the only sketch showing the aftermath of a failed assault. Long trenches were dug and bodies dragged into them. It is likely that white soldiers had already been buried in separate burial trenches. The crowd of Confederate onlookers in the background adds a disturbing, macabre touch to the scene. Details from E. F. Mullen drawing, "In front of Petersburg. Working party going through the covered way to the trenches at night." Boston University, Becker Collection CW-EM-VA-9/10/64. Woodcut (below) published Sept. 10, 1864 in Frank Leslie's Illustrated Newspaper. The drawings behind these woodcuts have not survived. "Siege of Petersburg -- Going to the Trenches. -- From a Sketch by Our Special Artist E. F. Mullen." Leslie's Illustrated Newspaper, Sept. 10, 1864. Sometimes work in the trenches was more rewarding than it was at other times.... 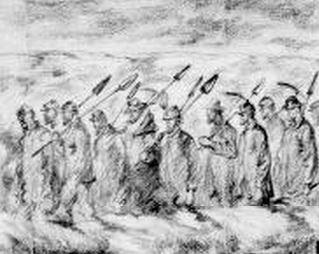 SCENES OF ARMY LIFE-DEALING OUT LIQUOR TO SOLDIERS IN THE TRENCHES- FROM A SKETCH BY OUR SPECIAL ARTIST E.F. MULLEN.